Context: The story is about a Chinese American family living in 1970s small-town Ohio. Lydia is the favorite child of Marilyn and James Lee, and her parents are determined that she will fulfill the dreams they were unable to pursue. On May 3, 1977, Lydia is missing. Nath, her brother, remembers how she had always lived a secluded life but pretended to be popular in front of her parents. Upstairs, Marilyn opens her daughter’s door and sees the bed unslept in: neat hospital corners still pleated beneath the comforter, pillow still fluffed and convex. Nothing seems out of place. Mustard-colored corduroys tangled on the floor, a single rainbow-striped sock. A row of science fair ribbons on the wall, a postcard of Einstein. Lydia’s duffel bag crumpled on the floor of the closet. Lydia’s green bookbag slouched against her desk. Lydia’s bottle of Baby Soft atop the dresser, a sweet, powdery, loved-baby scent still in the air. But no Lydia. Marilyn closes her eyes. Maybe, when she opens them, Lydia will be there, covers pulled over her head as usual, wisps of hair trailing from beneath. A grumpy lump bundled under the bedspread that she’d somehow missed before. I was in the bathroom, Mom. I went downstairs for some water. I was lying right here all the time. Of course, when she looks, nothing has changed. The closed curtains glow like a blank television screen. Downstairs, she stops in the doorway of the kitchen, a hand on each side of the frame. Her silence says everything. “I’ll check outside,” she says at last. “Maybe for some reason—” She keeps her gaze trained on the floor as she heads for the front door, as if Lydia’s footprints might be crushed into the hall runner. Nath says to Hannah, “She was in her room last night. I heard her radio playing. At eleven thirty.” He stops, remembering that he had not said goodnight. “Can you be kidnapped if you’re sixteen?” Hannah asks. Nath prods at his bowl with a spoon. Cornflakes wilt and sink into clouded milk. Their mother steps back into the kitchen, and for one glorious fraction of a second Nath sighs with relief: there she is, Lydia, safe and sound. It happens sometimes—their faces are so alike you’d see one in the corner of your eye and mistake her for the other: the same elfish chin and high cheekbones and left-cheek dimple, the same thin-shouldered build. Only the hair color is different, Lydia’s ink-black instead of their mother’s honey-blond. He and Hannah take after their father—once a woman stopped the two of them in the grocery store and asked, “Chinese?” and when they said yes, not wanting to get into halves and wholes, she’d nodded sagely. “I knew it,” she said. “By the eyes.” She’d tugged the corner of each eye outward with a fingertip. But Lydia, defying genetics, somehow has her mother’s blue eyes, and they know this is one more reason she is their mother’s favorite. And their father’s, too. Then Lydia raises one hand to her brow and becomes his mother again. “The car’s still here,” she says, but Nath had known it would be. Lydia can’t drive; she doesn’t even have a learner’s permit yet. Last week she’d surprised them all by failing the exam, and their father wouldn’t even let her sit in the driver’s seat without it. Nath stirs his cereal, which has turned to sludge at the bottom of his bowl. The clock in the front hall ticks, then strikes seven thirty. No one moves. “Are we still going to school today?” Hannah asks. Marilyn hesitates. Then she goes to her purse and takes out her keychain with a show of efficiency. “You’ve both missed the bus. Nath, take my car and drop Hannah off on your way.” Then: “Don’t worry. We’ll find out what’s going on.” She doesn’t look at either of them. Neither looks at her. When the children have gone, she takes a mug from the cupboard, trying to keep her hands still. Long ago, when Lydia was a baby, Marilyn had once left her in the living room, playing on a quilt, and went into the kitchen for a cup of tea. She had been only eleven months old. Marilyn took the kettle off the stove and turned to find Lydia standing in the doorway. She had started and set her hand down on the hot burner. A red, spiral welt rose on her palm, and she touched it to her lips and looked at her daughter through watering eyes. Standing there, Lydia was strangely alert, as if she were taking in the kitchen for the first time. Marilyn didn’t think about missing those first steps, or how grown up her daughter had become. The thought that flashed through her mind wasn’t How did I miss it? but What else have you been hiding? Nath had pulled up and wobbled and tipped over and toddled right in front of her, but she didn’t remember Lydia even beginning to stand. Yet she seemed so steady on her bare feet, tiny fingers just peeking from the ruffled sleeve of her romper. Marilyn often had her back turned, opening the refrigerator or turning over the laundry. Lydia could have begun walking weeks ago, while she was bent over a pot, and she would not have known. She had scooped Lydia up and smoothed her hair and told her how clever she was, how proud her father would be when he came home. But she’d felt as if she’d found a locked door in a familiar room: Lydia, still small enough to cradle, had secrets. Marilyn might feed her and bathe her and coax her legs into pajama pants, but already parts of her life were curtained off. She kissed Lydia’s cheek and pulled her close, trying to warm herself against her daughter’s small body. Now Marilyn sips tea and remembers that surprise. The high school’s number is pinned to the corkboard beside the refrigerator, and Marilyn pulls the card down and dials, twisting the cord around her finger while the phone rings. “I’ll have someone run down to that classroom and check.” There’s a thud as the secretary sets the receiver down on the desk. Marilyn studies her mug, the pool of water it has made on the counter. A few years ago, a little girl had crawled into a storage shed and suffocated. After that the police department sent a flyer to every house: If your child is missing, look for him right away. Check washing machines and clothes dryers, automobile trunks, toolsheds, any places he might have crawled to hide. Call police immediately if your child cannot be found. Marilyn hangs up without replying. She replaces the phone number on the board, her damp fingers smudging the ink so that the digits blur as if in a strong wind, or underwater. She checks every room, opening every closet. She peeks into the empty garage: nothing but an oil spot on the concrete and the faint, heady smell of gasoline. She’s not sure what she’s looking for: Incriminating footprints? A trail of breadcrumbs? When she was twelve, an older girl from her school had disappeared and turned up dead. Ginny Barron. She’d worn saddle shoes that Marilyn had desperately coveted. She’d gone to the store to buy cigarettes for her father, and two days later they found her body by the side of the road, halfway to Charlottesville, strangled and naked. Now Marilyn’s mind begins to churn. The summer of Son of Sam has just begun—though the papers have only recently begun to call him by that name—and, even in Ohio, headlines blare the latest shooting. In a few months, the police will catch David Berkowitz, and the country will focus again on other things: the death of Elvis, the new Atari, Fonzie soaring over a shark. At this moment, though, when dark-haired New Yorkers are buying blond wigs, the world seems to Marilyn a terrifying and random place. Things like that don’t happen here, she reminds herself. Not in Middlewood, which calls itself a city but is really just a tiny college town of three thousand, where driving an hour gets you only to Toledo, where a Saturday night out means the roller rink or the bowling alley or the drive-in, where even Middlewood Lake, at the center of town, is really just a glorified pond. (She is wrong about this last one: it is a thousand feet across, and it is deep.) Still, the small of her back prickles, like beetles marching down her spine. Inside, Marilyn pulls back the shower curtain, rings screeching against rod, and stares at the white curve of the bathtub. She searches all the cabinets in the kitchen. She looks inside the pantry, the coat closet, the oven. Then she opens the refrigerator and peers inside. Olives. Milk. A pink foam package of chicken, a head of iceberg, a cluster of jade-colored grapes. She touches the cool glass of the peanut butter jar and closes the door, shaking her head. As if Lydia would somehow be inside. Morning sun fills the house, creamy as lemon chiffon, lighting the insides of cupboards and empty closets and clean, bare floors. Marilyn looks down at her hands, empty too and almost aglow in the sunlight. She lifts the phone and dials her husband’s number. For James, in his office, it is still just another Tuesday, and he clicks his pen against his teeth. A line of smudgy typing teeters slightly uphill: Serbia was one of the most powerful of the Baltic nations. He crosses out Baltic, writes Balkan, turns the page. Archduke France Ferdinand was assassinated by members of Black Ann. Franz, he thinks. Black Hand. Had these students ever opened their books? He pictures himself at the front of the lecture hall, pointer in hand, the map of Europe unfurled behind him. It’s an intro class, “America and the World Wars”; he doesn’t expect depth of knowledge or critical insight. Just a basic understanding of the facts, and one student who can spell Czechoslovakia correctly. He closes the paper and writes the score on the front page—sixty-five out of one hundred—and circles it. Every year as summer approaches, the students shuffle and rustle; sparks of resentment sizzle up like flares, then sputter out against the windowless walls of the lecture hall. Their papers grow halfhearted, paragraphs trailing off, sometimes midsentence, as if the students could not hold a thought that long. Was it a waste, he wonders. All the lecture notes he’s honed, all the color slides of MacArthur and Truman and the maps of Guadalcanal. Nothing more than funny names to giggle at, the whole course just one more requirement to check off the list before they graduated. What else could he expect from this place? He stacks the paper with the others and drops the pen on top. Through the window he can see the small green quad and three kids in blue jeans tossing a Frisbee. When he was younger, still junior faculty, James was often mistaken for a student himself. That hasn’t happened in years. He’ll be forty-six next spring; he’s tenured, a few silver hairs now mixed in among the black. Sometimes, though, he’s still mistaken for other things. Once, a receptionist at the provost’s office thought he was a visiting diplomat from Japan and asked him about his flight from Tokyo. He enjoys the surprise on people’s faces when he tells them he’s a professor of American history. “Well, I am American,” he says when people blink, a barb of defensiveness in his tone. Someone knocks: his teaching assistant, Louisa, with a stack of papers. Louisa laughs. When he’d first seen her, in his graduate seminar last term, she’d surprised him. From the back she could have been his daughter: they had almost the same hair, hanging dark and glossy down to the shoulder blades, the same way of sitting with elbows pulled in close to the body. When she turned around, though, her face was completely her own, narrow where Lydia’s was wide, her eyes brown and steady. “Professor Lee?” she had said, holding out her hand. “I’m Louisa Chen.” Eighteen years at Middlewood College, he’d thought, and here was the first Oriental student he’d ever had. Without realizing it, he had found himself smiling. It was what everyone said. But from her he had expected something different. Still, at the end of the fall semester, he’d asked her to act as a grader for his undergraduate lecture. And in April, he’d asked her to be the teaching assistant for his summer course. James had meant only the intro course, teaching these students who, year after year, didn’t care to learn even the basic timeline. She’s twenty-three, he thinks; she knows nothing about life, wasted or otherwise. But it’s a nice thing to hear. “Stay still,” he says. “There’s something in your hair.” Her hair is cool and a little damp, not quite dry from her morning shower. Louisa holds quite still, her eyes open and fixed on his face. It’s not a flower petal, as he’d first thought. It’s a ladybug, and as he picks it out, it tiptoes, on threadlike yellow legs, to hang upside down from his fingernail. “Damn things are everywhere this time of year,” says a voice from the doorway, and James looks up to see Stanley Hewitt leaning through. He doesn’t like Stan—a florid ham hock of a man who talks to him loudly and slowly, as if he’s hard of hearing, who makes stupid jokes that start George Washington, Buffalo Bill, and Spiro Agnew walk into a bar . . .
“Did you want something, Stan?” James asks. He’s acutely conscious of his hand, index finger and thumb outstretched as if pointing a popgun at Louisa’s shoulder, and pulls it back. “I have to get going anyway,” Louisa says. “Have a nice morning, Professor Lee. I’ll see you tomorrow. You too, Professor Hewitt.” As she slides past Stanley into the hallway, James sees that she’s blushing, and his own face grows hot. When she is gone, Stanley seats himself on the corner of James’s desk. “Yes.” James unfolds his hand as the ladybug moves onto his fingertip, walking the path of his fingerprint, around and around in whorls and loops. He wants to smash his fist into the middle of Stanley’s grin, to feel Stanley’s slightly crooked front tooth slice his knuckles. Instead he smashes the ladybug with his thumb. The shell snaps between his fingers, like a popcorn hull, and the insect crumbles to sulfur-colored powder. Stanley keeps running his finger along the spines of James’s books. Later James will long for the ignorant calm of this moment, for that last second when Stan’s leer was the worst problem on his mind. But for now, when the phone rings, he is so relieved at the interruption that at first he doesn’t hear the anxiety in Marilyn’s voice. The police tell them lots of teenagers leave home with no warning. Lots of times, they say, the girls are mad at their parents and the parents don’t even know. Nath watches them circulate in his sister’s room. He expects talcum powder and feather dusters, sniffing dogs, magnifying glasses. Instead the policemen just look: at the posters thumbtacked above her desk, the shoes on the floor, the half-opened bookbag. Then the younger one places his palm on the rounded pink lid of Lydia’s perfume bottle, as if cupping a child’s head in his hand. Most missing-girl cases, the older policeman tells them, resolve themselves within twenty-four hours. The girls come home by themselves. The policeman peers over the top of his bifocals. “In the vast majority of cases,” he says. The younger officer jots down the particulars in his notebook: Lydia Elizabeth Lee, sixteen, last seen Monday May 2, flowered halter-neck dress, parents James and Marilyn Lee. At this Officer Fiske studies James closely, a memory surfacing in his mind. “I see.” The older officer pulls out his own pad and makes a note, and James raps his knuckle against the corner of Lydia’s desk. In the kitchen, the policemen flip through the family albums looking for a clear head shot. “This one,” Hannah says, pointing. It’s a snapshot from last Christmas. Lydia had been sullen, and Nath had tried to cheer her up, to blackmail a smile out of her through the camera. It hadn’t worked. She sits next to the tree, back against the wall, alone in the shot. Her face is a dare. The directness of her stare, straight out of the page with not even a hint of profile, says What are you looking at? In the picture, Nath can’t distinguish the blue of her irises from the black of her pupils, her eyes like dark holes in the shiny paper. When he’d picked up the photos at the drugstore, he had regretted capturing this moment, the hard look on his sister’s face. But now, he admits, looking at the photograph in Hannah’s hand, this looks like her—at least, the way she looked when he had seen her last. At her sixteenth birthday, the week before, Lydia sits at the table with a lipsticked smile. Though her face is turned toward the camera, her eyes are looking at something outside the photo’s white border. What’s so funny? Nath wonders. He can’t remember if it was him, or something their father said, or if Lydia was laughing to herself about something none of the rest of them knew. She looks like a model in a magazine ad, lips dark and sharp, a plate of perfectly frosted cake poised on a delicate hand, having an improbably good time. James pushes the birthday photo across the table toward the policemen, and the younger one slides it into a manila folder and stands up. “This will be just fine,” he says. “We’ll make up a flyer in case she doesn’t turn up by tomorrow. Don’t worry. I’m sure she will.” He leaves a fleck of spit on the photo album page and Hannah wipes it away with her finger. “She wouldn’t just leave,” Marilyn says. “What if it’s some crazy? Some psycho kidnapping girls?” Her hand drifts to that morning’s newspaper, still lying in the center of the table. When the policemen have gone, Marilyn and James sit down with a piece of scratch paper. The police have suggested they call all of Lydia’s friends, anyone who might know where she’s gone. Together they construct a list: Pam Saunders. Jenn Pittman. Shelley Brierley. Nath doesn’t correct them, but these girls have never been Lydia’s friends. Lydia has been in school with them since kindergarten, and now and then they call, giggly and shrill, and Lydia shouts through the line, “I got it.” Some evenings she sits for hours on the window seat on the landing, the phone base cradled in her lap, receiver wedged between ear and shoulder. When their parents walk by, she lowers her voice to a confidential murmur, twirling the cord around her little finger until they go away. This, Nath knows, is why his parents write their names on the list with such confidence. But Nath’s seen Lydia at school, how in the cafeteria she sits silent while the others chatter; how, when they’ve finished copying her homework, she quietly slides her notebook back into her bookbag. After school, she walks to the bus alone and settles into the seat beside him in silence. Once, he had stayed on the phone line after Lydia picked up and heard not gossip, but his sister’s voice duly rattling off assignments—read Act I of Othello, do the odd-numbered problems in Section 5—then quiet after the hang-up click. The next day, while Lydia was curled on the window seat, phone pressed to her ear, he’d picked up the extension in the kitchen and heard only the low drone of the dial tone. Lydia has never really had friends, but their parents have never known. If their father says, “Lydia, how’s Pam doing?” Lydia says, “Oh, she’s great, she just made the pep squad,” and Nath doesn't contradict her. He's amazed at the stillness in her face, the way she can lie without even a raised eyebrow to give her away. Except he can't tell his parents that now. He watches his mother scribble names on the back of an old receipt, and when she says to him and Hannah, "Anyone else you can think of?" he says no. On May 3, 1977, Lydia Lee, the middle child of the Lee family is missing. After several days, her body is dredged out of the town lake. Lydia's parents, James and Marilyn, are horrified by their daughter's death. As the police investigate, her parents discover that contrary to their belief that Lydia was popular and doing well in school, she was actually a loner with almost no friends and that her grades had severely slipped. The delicate balancing act that has been keeping the Lee family together is destroyed, tumbling them into chaos. 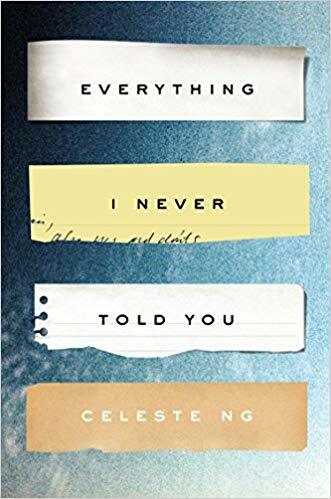 A profoundly moving story of family, secrets, and longing, Everything I Never Told You is both a gripping page-turner and a sensitive family portrait, uncovering the ways in which mothers and daughters, fathers and sons, and husbands and wives struggle, all their lives, to understand one another.